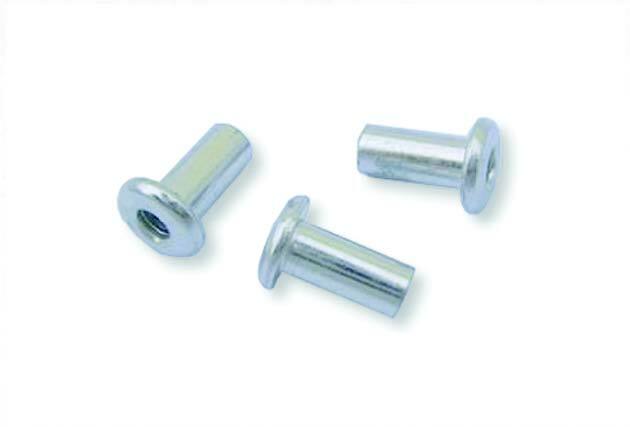 Speed rivet with a repetition system suitable for applications with soft or fragile materials. Bralo BSV Rivet is synonymous with control and efficiency. Bralo BSV Speed Rivets are designed for the joint of soft or low resistance materials that require a controlled tightening. They are supplied in a strip of paper (loading system) and placed using a repetition system with a single mandrel. At the end of a riveting cycle, the next rivet is automatically fed in the tool nose-piece, ready to begin a new cycle. The result is a fast, simple and low cost assembly. High precision and high quality assembly. It does not deform surfaces after the riveting process is finished (painted, glazed…etc. ).